← Best laid plans and all that…. This is a rather rare twin crown diver, but I have seen one or two of them, which helps to confirm its authenticity. 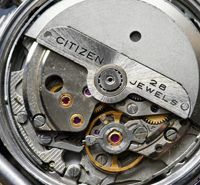 They date from the late 1960s, and as far as I know there were three models, all using the 21 jewel 5270 movement running at 18,000 beats per hour. Pom’s watch has the case code of 4-520017, and closest to that is the 4-521315 but has the winding crowns in different positions. The other model is the 4-520343 – this one is seen a little more often, but also came with different coloured dials and has a different inner bezel ring. 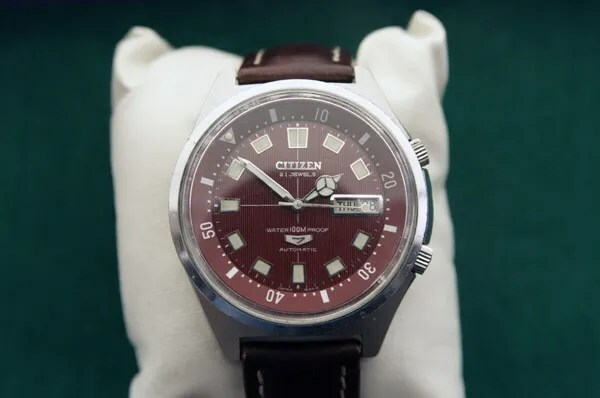 This entry was posted in Vintage Watches and tagged Citizen Compressor Diver, Vintage Citizen Diver. Bookmark the permalink. Thank you for all the info and for taking time to write about my watch. I’ve had a Parawater stuck up in the loft for over 30 years. I came across it again while having a clear out. I’ve decided to have serviced and put it up for sale to let some one else take more loving care of it. It’s a 4-520343-Y [Blue dial and bezel] in really good condition. It seams to be a very rare item these days. Hi Paul, great to hear that you have one of these – and that you’ve owned it for 30+ years 🙂 The blue one is indeed rather rare, I think I’ve seen just a handful for sale over the last three or four years. I have the red version, which seems even rarer! Would be good to see some pictures – do you have any you could post a link to? Wow!, I spent most of the day browsing to see how rare this might be – it seems there are none for sale so collectors must holding on to them. Looking closely at the dial it also is striped top to bottom, though this is hard to see unless close up. I’m going to have it serviced and try to obtain an original bracelet, which is missing at the moment. When finished I’ll come back and give a link to some photos. Hi Paul, thanks for the links – you have a splendid example. Looks like a ‘0’ at the start of the serial number so it’s from June 1970 (you probably knew that already though!) Has the same style back as mine, and with ‘waterproof’ rather than ‘parawater’ on the dial these were export models. Actually it’s a 9, so June 1969. You know, there’s something about the Parawater isn’t there? There are watches, and then there are watches that set them apart from the usual ‘run of the mill’ type. I know the Parawater was made in its thousands, but Citizen hit on some unique here. The simplicity of its design, its weight and how it feels seem to have all come together in a watch that really sets it apart. Hi Paul – thanks for clarifying the date. 1969 makes more sense, I think I’ve only seen examples of these compressor types from 1968 and 1969, so far anyway. The short production run of these also makes them an interesting piece. Hmm! Just spotted another one for sale with a nice black dial. A very nice example. 🙂 the black ones are seen the most (still not frequent though). I’ve given the Parawater a service because it had stopped working, needed a new spring as the old one had broken which surprised me. Anyway, I gave it a good clean while it was stripped down. Now it’s like mint condition works fine but I need a new set of hands for it; lost the second hand and the lume in the hour hand crumble away while removing it. Does anyone know the sizes and a source for the same hands? Hi Paul – good to hear that you’ve serviced the watch, but losing the second hand is a real bummer. I would have thought a donor watch is the likeliest way to go. Have you thought about re-luming the hands? The ones on mine have been done for me. You probable quessed I’m new to watch repairing. I did buy a couple of donor 5270 movements to practice on before even attempting to repair mine – great fun and very interesting. I managed to get one of them working. Still a lot to learn though. Anyway, I spent about an hour on hands and knees with a powerful torch and scanned it across the carpet where I was sitting; thinking I would find the second hand nearby. But no, I managed to find it a few metres away. But I found it – great. Now I need to relume the hour and minute hands and dial. So I’m looking for reputable company that can do that. I read somewhere that SuperLuminova is a well recognised brand, but I also read on some other forum that there’s a far better luminous paint, unfortunately I cannot recall where I read the info on the latter. Pehaps someone can advise me on this! Hi Paul, great to hear that you found the second hand 🙂 And good on you for learning how to service a watch, something I would like to try…..at some stage. The re-lume on mine was done by a fellow collector – an amateur – so I haven’t any experience other than that. I would advise though that you look for lume that would go well on a vintage watch which may not necessarily be the brightest! I’ll contact the chap who did mine and see what he advises, and let you know. He may also know someone to recommend for your job. Whereabouts in the world are you by the way? Hi Steven, I’m in the UK. Yes, the lume colour has to look right. After testing the dial hour markers it seems that they’ve lost their ability to retain luminosity for any reasonable time so I’ll look into the cost of getting that done. Hi Paul – it’s worth bearing in mind that the original lume, if in good condition, is valued more than a re-lume even it it has lost its luminosity. It looks to be good in your pic, but I appreciate it’s not a close-up. The chap who did mine uses ‘Noctilumina’ which is what suits him best, although he doesn’t know if that is the best for vintage. I’ll e-mail details of a watch repairer you could try. year of manufacture, model, etc. 71-1837 is the model number; 4-280334 is the case number and 1139631 is the serial number. 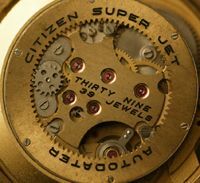 And it’s the serial number which helps us date the watch – the first ‘1’ is for the year and the next ‘1’ is for the month. So it was made in January of 1981 or 1991. Hi Ricardo, this is very similar to your other watch. Although it might not have the Eagle 7 on the dial it is from the same line, using an 8200 movement. I should have said in my last reply that these also hand wind. Model number is 71-2175 and case number is 4-280717. The eight digit serial number – 20205899 – suggests to me that it’s from February 1982. For those who love watches of beauty, I have just updated the images of my Parawater 4-520343 Y. See the links above. 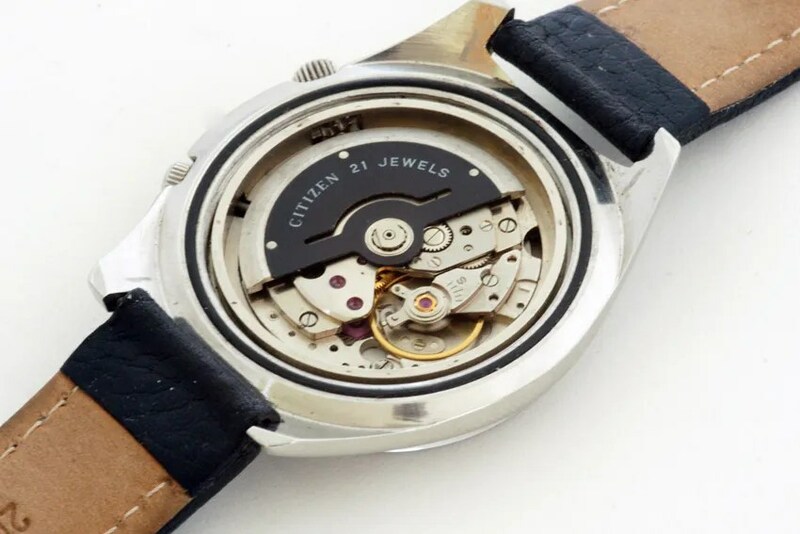 I managed to find a nice original Citizen stainless steel bracelet. Although not a Parawater original bracelet, but I think it compliments the watch head quite nicely. An update on the lume. The lume is all original and probably the best surviving example for a watch of its age; except for the lume on the minute hand which I relumed because it disintegrated on removing the hands when servicing the watch. I’m still looking for an exact original minute hand with its original lume to replace it. Know anyone who might be interested in purchasing my blue compressor above. It’s time for me to let it go – at the right price of course. Hi Paul – I don’t know of anyone I’m afraid (I did contact one guy who I thought might have been interested to check). There aren’t many Citizen collectors compared to the likes of Seiko, so the market is smaller and prices will reflect that to some extent. Perhaps a few words about the definition of “Compressor” is in order. I am not certain the term is being used correctly in regards to Citizen Parawater twin crowns. As a background, “Compressor” watch cases were patented by EPSA and came in three styles. They refer specifically and only to the case sealing method and, as some might correctly assume, the greater the depth underwater, the tighter the case becomes. 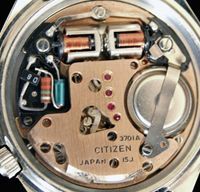 One fact needing greater attention is that the third compressor patent (Super Compressor) is usually found on dive watches from the 1960s and early 70s. Dual crowns are used with an inner rotating bezel with the upper crown rotating the bezel. However, Super Compressors come in single crown versions. I have a number of them. Bottom line is that a watch with twin crowns is exactly that. Unless you find the specific EPSA designed technology (and brevet numbers or at least their diving helmet logo) you do not have an EPSA “Compressor” case. What are the patent numbers associated with the case? 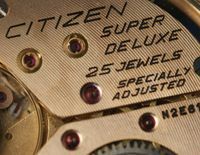 Is the design by Citizen their interpretation of a popular trend back then? I suspect so but would love to see more case backs — inside and out. So, I guess we should not be calling these Citizen models ‘compressor’ divers – would ‘compressor style’ be acceptable do you think? Until proven otherwise, I think just “Twin Crown” is most appropriate. As far as I know, EPSA only produced internal rotating bezels with the Super Compressor technology. As those cases may have single or twin crowns, for clarity, I think it’s better using that term exclusively to those watches known to have the brevet numbers associated with specific Super Compressor patents. 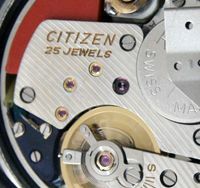 In reality, it is the caseback and the crystal sealing design that is most associated with the term “Super Compressor” and not the number of crowns. It is a compliment to the work you have done, and are doing, that it’s cited by many as an authoritative source for Citizen watches. Hence, I think it’s important for researchers to see the key differences, especially when they are buying them on eBay, or are given a family heirloom. Hi Hunter – thanks for your clarifications about the compressor designs, I do appreciate it. I am learning all the time 🙂 I think you’re right that this should be reflected in my references to these watches, so I’ll do some editing and a post about this later. Hi Hunter – just done a post about this issue. I’ll do some editing later, particularly on the diver reference page, to change from ‘compressor’ to ‘twin crown’. Taken me a bit longer to get to this than I’d intended – I had a system disk failure so had to replace it. Thank goodness I had cloned it!